Confidence is the best self defense! That is exactly what your child will gain, along with age-appropriate developmental skills, in our Tiny Tigers program! Tiny Tigers enjoy a fun, nurturing environment that instills the necessary skills and attitudes to embrace life with an “I can do it” attitude! Classes are designed specifically for this age group's developmental level for essential physical, cognitive, emotional, social and behavioral progress. Tiny Tigers progress sequentially through their age-appropriate early skills like with rolling, running, throwing, catching, blocking, kicking and punching. 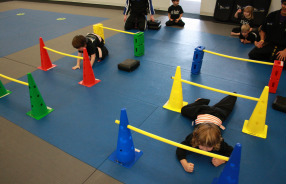 While refining their gross motor skills, they also establish the basic fundamental skills which include focus, teamwork, control, balance, memory, discipline, fitness and coordination. These set the stage for becoming an outstanding athlete, scholar and citizen! These eight skills are important to have for Martial Arts and virtually any other sport or activity. So whether your child decides to continue toward a Black Belt or play other sports, a strong foundation will be in place for his or her future success. Taught through drills, activities and games that children this age love, you will see measurable results while your child has a blast! 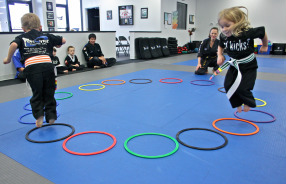 Martial arts skills and 3-5-year-old abilities soar in engaging classes filled with fun and imagination! We look forward to working with your Tiger. We emphasize family values and believe that every member of our student's family is a part of the student's "success team." We will work together to help your child succeed - in Martial Arts and in life! CLASS SCHEDULE | Tuesdays & Thursdays 6:45-7:15 p.m.